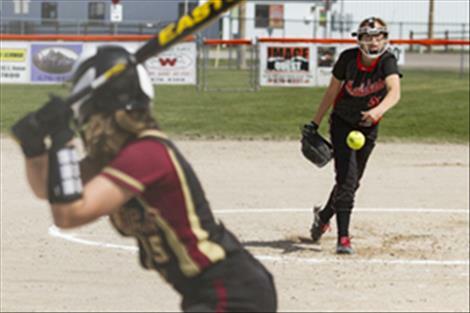 Maidens’ Melanie Adams pitches a strike against a Florence batter. RONAN – Maidens’ Katlyn Santos went 1-for-3 with a double and two RBIs as Ronan was defeated by visiting Florence 16-4 on Saturday. Thursday, Ronan was swept in a doubleheader match up with visiting Loyola 16-4 and 18-6. For the Maidens, Madison Clairmont slugged a home run and had two RBIs in game one. Shay Waldbillig, Emily Kinnaman (5) and Brooklyn Little. Melanie Adams and Regan Clairmont. W – Waldbillig. L – Adams. Ronan – Courtnee Clairmont 2-3, Madison Clairmont 1-3, Regan Clairmont 0-3, Marissa Mock 2-2, Katlyn Santos 1-3, Jaylyn Hakes 1-3, Ysabelle Burland 0-0, Taylor Tobol 0-2, Lanissa Mahkuk 1-2, Melanie Adams 0-0. 2B – Santos. RBIs – Clairmont, Santos 2. Kayla Hickethier and Carly Tipp. Melanie Adams, Marissa Mock (4), Madison Clairmont (6) and Regan Clairmont. W – Hickethier. L – Mock. Ronan – Courtnee Clairmont 2-2, Madison Clairmont 1-3, Regan Clairmont 1-3, Marissa Mock 0-3, Katlyn Santos 0-3, Jaylyn Hakes 1-2, Sky Chandler 0-1, Ysabelle Burland 0-2, Taylor Tool 0-1, Lanissa Mahkuk 1-2. HRs – Madison Clairmont. RBIs – Katlyn Santos, Madison Clairmont 2. Melanie Adams, Regan Clairmont (4) and Sky Chandler. Charla Goodman and Carly Tipp. W – Goodman L – Adams. Ronan – Courtnee Clairmont 1-3, Madison Clairmont 1-2, Regan Clairmont 0-1, Marissa Mock 0-2, Jaylyn Hakes 0-2, Ysabelle Burland 1-2, Adams 0-1, Chandler 1-3, Lanissa Mahkuk 0-0. RBIs – Courtnee Clairmont, Chandler, Hakes, Mock.